We all love pancakes in this house, and these gluten free wonders are my all-time favourite low carb version. There are many delicious variations of cream cheese pancakes out there. Some keto recipes contain only eggs and cream cheese, which works well, but tastes a little on the eggy side. Other low carb recipes add in either coconut or almond flour or a bit of both – these two low carb flours always work well together. 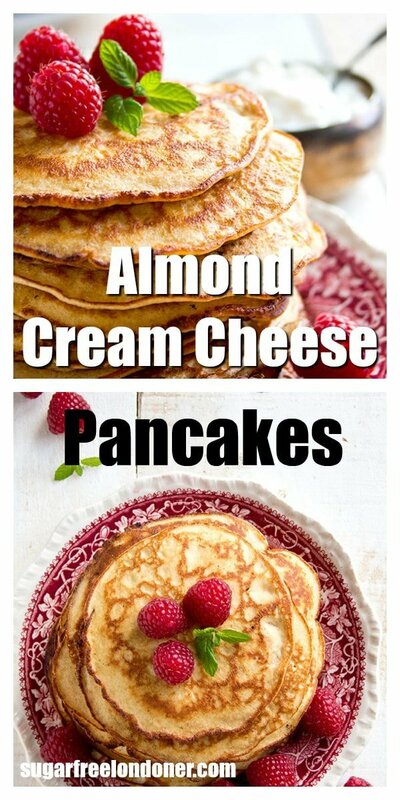 I’ve probably tried ALL low carb pancake versions known to man, and I can honestly say…. 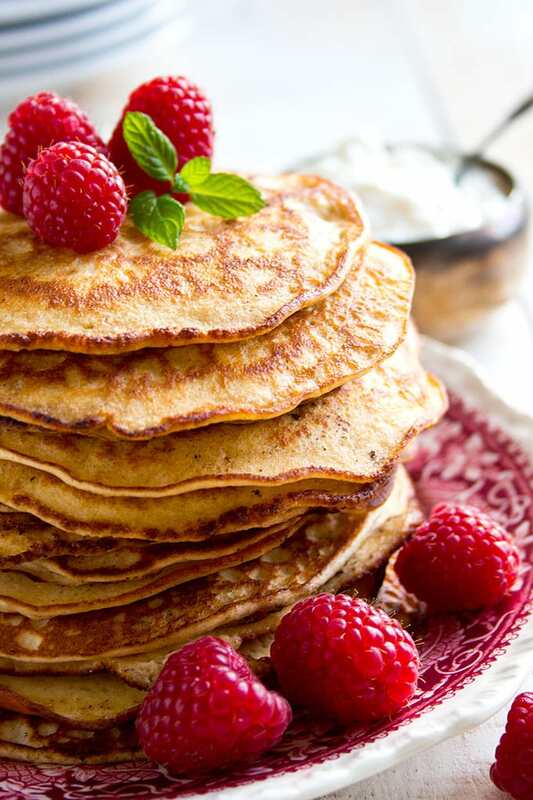 This is the most delicious almond flour keto pancake recipe you’ll ever make! Fine almond flour is a great alternative to wheat flour. By using almond flour you are ensuring your pancakes are seriously nutrient dense, and still have the texture of “real” pancakes. 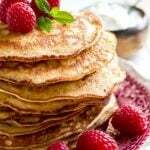 But unlike wheat pancakes, this low carb pancakes recipe will provide you with a steady supply of energy that won’t send you blood sugar sky-high and will keep you satiated until lunch. NOTE – Almond flour is not the same as ground almonds or almond meal. It is a much more finely ground flour made from blanched almonds, which gives a texture that resembles wheat flour. The almonds in almond meal are almost always ground with their skins still on. The almond flour I used, by Sukrin, has also been cold-pressed, so 80% of the fat is removed. It makes the pancakes light and fluffy, just like we enjoyed them in the good old days before we realised that wheat is really not a healthy thing to eat. Even so, regular almond flour that is not de-fatted will also work well. These keto pancakes are so moreish they will make you as happy as a hug from a lovely friend 😉 Even better, they’re super quick to put together. You can almost do it while you’re waiting for the kettle to boil. I recommend to keep the pancakes on the small side to avoid them falling apart. Why? 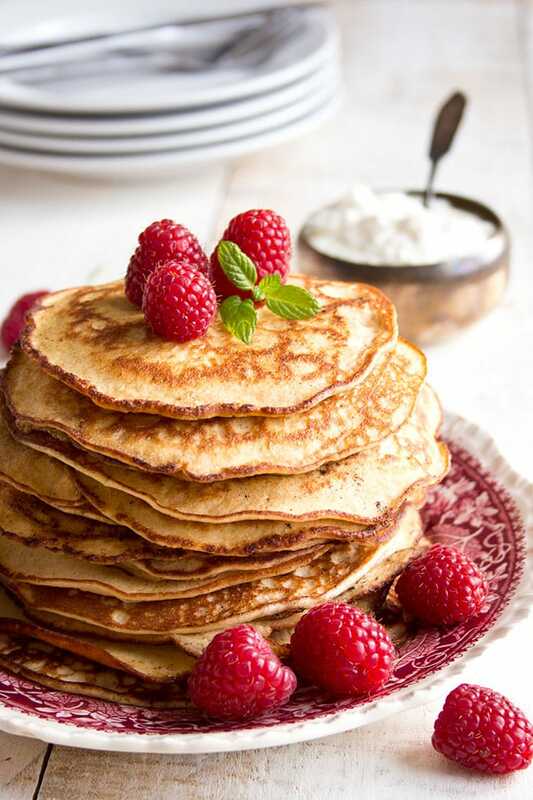 Almond flour pancakes are more fragile than regular pancakes because of the lack of gluten. 10-12 cam diameter is best. Medium heat works best. If you heat the pan too much low carb pancakes will burn. You can use butter to fry, alternatively coconut or avocado oil will work too. Wait until the centre of the pancake begins to bubble, then flip them. Also, it’s worth-while to invest in a quality non-stick pan when you’re cooking low carb, so your pancakes are easy to flip and don’t stick. Read all about my top low carb kitchen essentials here. Need some more low carb breakfast inspiration? Deliciously light and fluffy Keto pancakes! 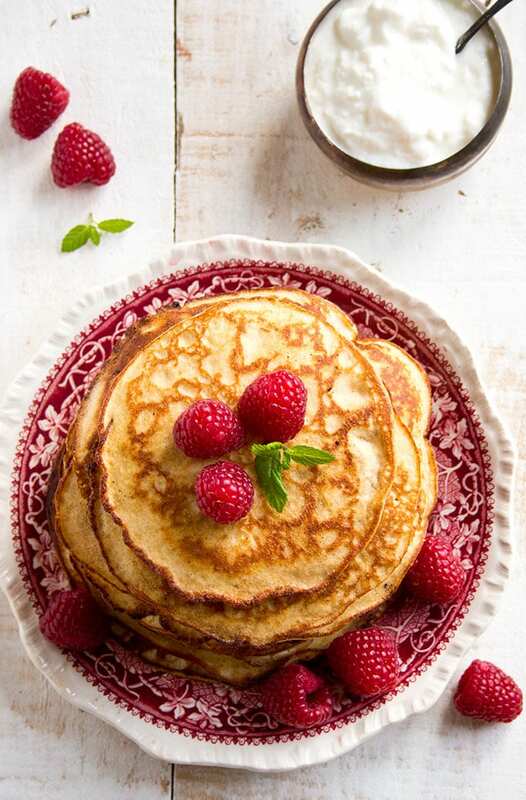 This almond cream cheese pancake recipe is the most popular recipe on Sugar Free Londoner. Super easy recipe!! Fry pancakes in melted butter in a non-stick pan over a medium heat. Turn over once the centre begins to bubble. The pancakes should be smallish, ca 10-12 cm in diameter. About the right size to fit them in the toaster the next day should you be so lucky to have any leftovers. I have not added the butter to the nutritional info - how much butter you need will depend on the type of pan you use. It’s really not like me to write a response online but I had to make an exception to your site and thank you. Hi Julie, thank you so much for your kind words. I’m glad you found my site! I just made these for my husband’s breakfast. We’re new to this Keto lifestyle and I’m learning that serving sizes can be teeny tiny. He enjoyed them. I’m just having BP coffee so I didn’t try any but what I noticed is that they’re more like a crepe than a pancake. If I add a little more almond flour to make them just a little thicker will that cause them to fall apart or really change the taste? Not concerned if the only affect is adding a few more net carbs. If you wanted to make them thicker and fluffier you could use some baking powder to make them rise. Great pancakes! I will make these again! These are delicious! I used only 3 eggs and added the baking powder, tastes just like the real deal! Mine fell apart on the sides. I had it on medium heat but when I went to flip them over they just fell apart on the sides. The rest was fine. What heat do you cook them at and for how long each side? They tasted great though! I cook mine on medium heat because almond flour burns easily. I did not time how long it took – I turn them over when the top starts to bubble and firm up. I also make them fairly small so they are easy to turn over with a wide spatula. Thanks for this. This is the first low carb pancake that I tried that resembles real pancakes and tastes good too and I’ve tried a few. These are so amazing. I’ve made them 3 times in the last 2 weeks. I love having breakfast for dinner especially when I’m intermittent fasting… Thank you so much for these! Can I use this recipe for waffles? In New Zealand I can only find Almond Meal and Ground Almonds. Would either of those two work. Thanks. Just use ground almonds, that’s what we use in the UK mostly as well. Regular almond flour in the US is basically ground almonds. Super-fine almond flour is nice in this recipe, but not essential. Ground almonds will work. I made this recipe this morning. I added an extra tablespoon of ground almonds, a half teaspoon of baking powder and a half teaspoon of guar gum. I got 12 pikelet size and 8 little ones. They taste great with sugar free jam and cream out of a can. My partner liked them too. This is the first pancake recipe I have tried since starting Keto 9 months ago. They are great! My butter started to burn after the second pancake so I wiped out my non stick pan and continued with ghee. That worked GREAT! I did use the baking soda and a hand mixer. Yum! I ate them with sugar free maple syrup and that was delicious. The next day I used two for a peanut butter and jelly sandwich. Yum! I can’t wait to make them again. I’ve tried other pancake recipes out there and this is the best yet. I have recently started using superfine almond flour fir all my cooking (I use Bob’s Red Mill) and I think that makes a big difference in texture. I took your advice and added 1/2 tsp baking powder and the pancakes fluffed up nicely. I also added a splash of homemade orange extract and a wee pinch of salt. I served bacon with them, so I fried them in the left over bacon grease. They seemed a little dry after cooking so I added fresh mashed raspberries as a topper and they turned out yummy! That sounds like a fabulous breakfast!!!! First time making keto friendly pancakes and I have to say this is the best even better then regular pancakes. Thanks so much for sharing. Will always be making these for breakfast. Glad you like the recipe Susan!! Hi the nutritional facts are for one pancake or two? Also how many tbsp of batter did you use for one pancake to match the nutritional facts? Hi, it’s for 2 pancakes = 1 portion. Mine were 10-12 cm in diameter – I did not measure by tbsp. These were great! They were a little flat even though I added the 1/2 tsp baking powder but the flavor was awesome! This definitely will be my weekend breakfast staple! Hi there I just tried to make the pancakes today and I substitute the almond butter for coconut flour and my mix is very thick is this normal? HI Bibiana, if you use coconut flour instead for almond flour you should only use 1/3 of the amount stated. Coconut flour absorbs more liquid than almond flour, that’s why your mix ended up thick! I don’t know where I went wrong. My batter was runny and pancakes were flat, really flat. I followed the instructions. Will someone please chime in as to what you think may have gone wrong? Hi Terri, did you use fine almond flour? If the almond flour is coarse, your batter would end up more runny. I’m glad you found a keeper!! I agree….only 3 eggs are needed and more almond flour. I’d also recommend letting batter sit for 5-10 minutes before pouring. Does anyone know how these turn out using a griddle instead of a pan? I don’t think using a griddle would be a good idea. Almond flour pancake dough is more fragile than regular dough. It might get stuck in the grooves. I cooked them 3 days in a row on a seasoned flat cast iron griddle and they worked out fine with medium flame. Made these this morning and they were delicious. I used egg beaters (no cholesterol) instead of eggs and worked perfectly. My go to recipe from now on! Hi there, the nutritional label you put up there, is that per serving or per batch? Supper yummy!!! I added a little bit of vanilla and they were divine!!! Even my husband liked them and he is such a picky eater. Thank you! I made these with just 2 large eggs as I didn’t want all the egginess so to speak. They held together better and were really good! These are the best keto pancakes I’ve ever tried! I have not tried this but it should work! You may want to bring it to room temperature before using, to make sure it’s pourable. They’re a little eggy but I didn’t mind. I substituted nutmeg for the cinnamon and added a tiny splash of orange extract. It made them taste like French toast and the kids loved them. They turned out really good. I did put in 1 1/2 teaspoons of baking powder and used 2 eggs whites and 2 eggs. No egg taste. Very good!!! Thank you for the recipe. These pancakes tasted really nice. I found the batter mix a bit watery and although I added baking powder they were a bit thin, more like a crepe. But still nice. What could I add or leave out to make it a bit thicker? Just made these pancakes for the first time . Served with raspberry coulis and whipped cream. A real treat on a rainy Sunday morning. Next time I will add a bit of salt and some lemon extract. Mmmmh, I like the idea of raspberry coulis! I subtracted 1 egg (only had 3 on hand) ….and added about half tsp baking powder. Sooooo GOOD! They were just as good or better than regular pancakes! Topped them off with Walden Farms pancake syrup! SOOO YUMMY! Made these for breakfast this morning with sugar free syrup. Thanks for sharing. Made these last night. I added 1 tbsp of cocoa powder, instead of the xtra tbsp of almond flour. Added some vanilla and a tsp of baking soda. With the addition of cocoa I’d add a bit more sweeter than the recipe calls for perhaps 2 tsp (I used Swerve) I then topped them off with all natural peanut butter. I really liked the texture of them, they made for a nice supper and were excellent in the toaster the next morning. Amazing recipe!! But I was concerned about not eating vegetables in the morning unless they were combined with eggs, so a friend of mine suggested to add spinach in the blender and guess what? They turn out pretty great! I tried this recipe and I think they turned out pretty goo. The only complaint I would have is they seemed a little eggy? Any ideas? What is the serving size one pancake? My husband is allergic to nuts, so almonds is a no go for him. I’ve been looking for pancakes for a while and haven’t really found one with good comment reviews! But this one really has excellent reviews! But, I’m wondering what will be my measurement for coconut flour to substitute the almond flour? Try with 1/3 to 1/2 the amount. Coconut flour is way more absorbent than almond flour. 2 eggs, 2 oz cream cheese, cinnamon to taste, 1tsp sugar substitute. They will be a thinner pancake but worthwhile. 4 pancakes are about 3 net carbs. Add about 1 teaspoon of vanilla instead of the cinnamon for a different taste. You’re right though, they are thinner and a bit fragile. I put in about a tablespoon of almond flour and found it toughen’s them up a bit and you get a bit “fuller” feeling. Fry them in Ghee and put a bit of butter on each one as you plate them. Finally, use Walden Farms pancake syrup; since the syrup is ‘0’ calorie then, buy definition, it has ‘0’ carbs. a couple of pieces of microwave “fried” bacon and you’ll be in temporary heaven. These were fantastic!! I just loved them for my Saturday morning breakfast with some strawberries. Day 6 if Keto and this recipe tried successfully gave me the motivation to keep going! My only question is how do you store be leftovers so you can put them in the toaster tomorrow? Thanks so much! Hi there, I’m glad you like them!! I just leave them on a plate, wrap it in clingfilm and store them in the fridge. I added a little unsweetened coconut flakes, a touch of vanilla, and chopped Walnuts, and then nuked a couple strawberries in water and made a sort of compote. Yummy! Thank you Shala, chocolate chip pancakes sound like a great idea! The taste was great. But fluffy no. I followed the recipe exactly. They were more like crepes. To rest of the batter I added backing powder and that helped. But still not fluffy. These were easy to make and delicious! Thank you for sharing this recipe. Would a levening agent like baking powder work to make them puffy? Thank you. Of course, you could add baking powder to puff them up. Or take the time to beat the egg whites until stiff and fold them in last. I tried these and they were pretty good, but a bit dry. Do you think adding a little oil or butter to the recipe would help? Suggestions on what would be best (maybe coconut), and how much? So happy to have found your site…and KETO pancakes, again! Hello Terry, you could definitely add coconut oil or butter to the recipe if you prefer. Maybe 1 tsp per pancake? Just curious if anyone has tried substituting some or all the almond flour with a protein powder baking mix like the one from Quest? I’d love to pack some more protein in these without upping th carbs. They’re a huge hit with my wife and kids. Hi Everett, I’ve never used protein powder in cooking, but I don’t see why it shouldn’t work. There are many pancake recipes out there that use protein powder. Just give it a try! Excellent recipe! I have made coconut/ almond flour pancakes, almond flour and coconut flour pancakes, but I’m sticking with THIS recipe! Mine came out super thick, so I had to add water to the mix. Is the mix suppose to be thick?? No, it should be easily pourable, just like in the video. Did you measure your ingredients? What do you think could have caused them to be thick? Can I prevalent the batter for use there next morning? Do you think I could replace the cream cheese with cottage cheese to increase the protein? i should think so, if you give it a really good whirl in your mixer to get it smooth. Wow! Finally an internet recipe that delivers! Amazing! Thank you. Hi Sue, great to hear that you are enjoying the pancakes! Hope you’ll check out some of my other recipes in time. Have a fab day! I didn’t think it was necessary to add it. But some of my readers have decided to add some, which makes them rise more. It’s really up to you and what you like. Enjoy the pancakes!! If I wanted to add baking powder ‍♀️How much would I add? I think 1/2 tsp would be enough. Wow, this was great! So easy to make; I topped mine with some whipped cream for 1 more than of carb. I’m going to share these with my dad, who is diabetic. Thank you so much! Hi Cindy, I’m so glad you like the recipe! I love especially that I can pop them in the toaster the next day – because they’re just the right size. Read it, made it, ate it. 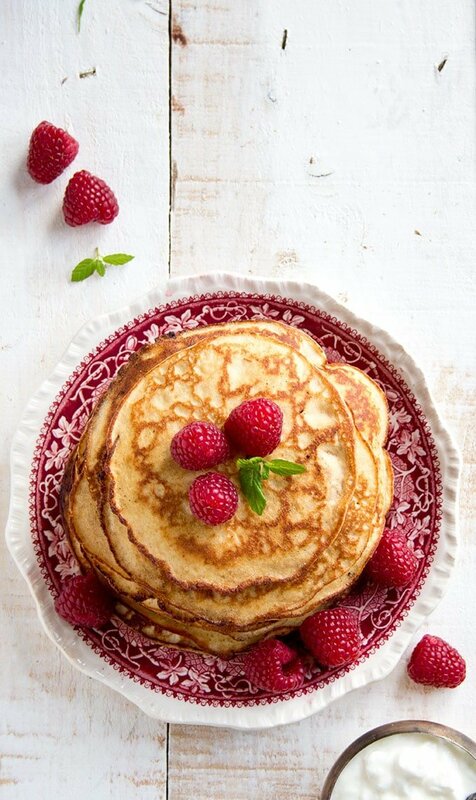 Very nice pancakes! Can you make the batter ahead and store in the fridge? How many make up a serving? These are truly wonderful. Surprised you didn’t add in a bit of baking powder, reason? Also Katrin, reading your posts I don’t detect even the hint of an english accent. Thank you again for this recipe.